A two-phased, two-year construction project in the Steele Ocean Sciences building (SOSB) has concluded, converting approximately 16,000 square feet over two floors into new science labs, office and meeting space. The retrofitted rooms and equipment were financed through the Canada First Research Excellence Fund which was awarded to the Ocean Frontier Institute (OFI), a collaborative research initiative led by Dalhousie University. While the bulk of OFI’s funding is used to advance ocean research, a portion of its budget is earmarked to strengthen the infrastructure and facilities ocean scientists require. The first phase of construction was completed a year ago and includes a 32-seat meeting room with full video conference abilities and a 1,100 square-foot marine geosciences lab. The lab’s first occupants are Owen Sherwood and Vittorio Maselli, both assistant professors in the Department of Earth Sciences. More recently, construction crews put the finishing touches on the fourth floor, enabling its new tenants — Oceanography professors Zoe Finkel and Hugh MacIntyre as well as Earth Sciences professor Mladen Nedimovic — to move in. Dr. Waite will also eventually be based there. 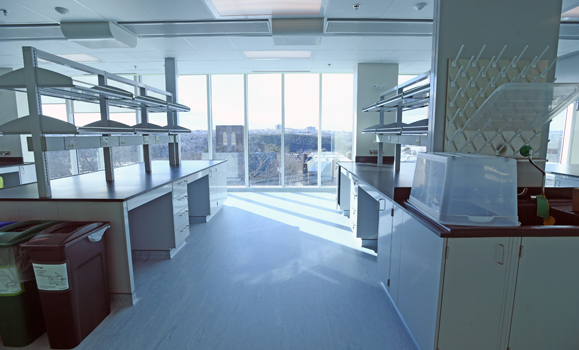 The fourth floor labs are equipped with incubators, freezers, chemical storage, fume hoods, a glassware washer and sterilizer, and multiple benches and microscope rooms. The labs are open-concept style, allowing the work space to support future growth in ocean research. The new construction fulfills the vision for the SOSB which opened six years ago to support researchers in their work to discover innovative solutions to ocean-related issues. The SOSB houses part of the Aquatron (the largest university aquatic research facility in Canada), the Canada Excellence Research Chair for Ocean Science and Technology laboratory, and serves as headquarters for OFI, the Ocean Tracking Network and the Marine Environmental Observation Prediction and Response Network. Take a tour of the newly constructed fourth floor of the Steele Ocean Sciences Building, home to the Ocean Frontier Institute (OFI). From 1:30 pm to 2:30 pm on Thursday, Feb. 14 — OFI will open up its doors to let the Dal community tour the lab space. Refreshments will be served.